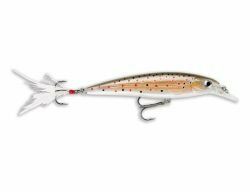 The X-Rap is “all about the action.” It’s the perfect size, shape and 3D illusion of a minnow. Prominent scales and lateral line on the fuselage capture and flash light like a beacon. It can be fished both in an aggressive “Slashbait” technique or with a classic Rapala wobble. The angler defines the cadence for maximum effectiveness.